After such a successful effort to make our own 3D glasses last week, Adam and I wanted to come up with another alternative glasses-making method for people who don't happen to have lighting gel samples around the house. 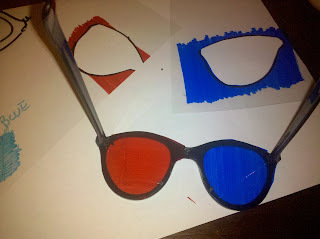 We found this tutorial on Instructables that used red and blue sharpies and overhead transparency sheets to create 3D glasses lenses and decided to investigate. I have to say I was pretty skeptical at first, but with a little patience, the Sharpie method is actually quite effective! 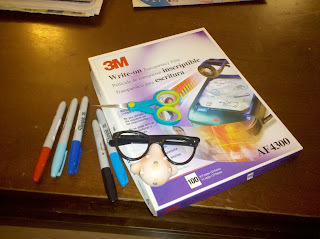 We used some write-on transparency sheets, the second pair of weird Halloween glasses from my parents, blue and red sharpies, and super glue. We decided to try a variety of different shades of blue sharpies to see which was closest to the Cyan needed to achieve the 3D effect. 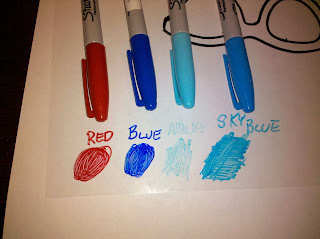 We tested blue, aqua, and sky blue, but in the end the regular blue was a much better match. 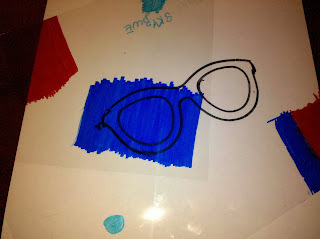 To finish the glasses we glued the lenses to the frames, touched up any places where we smeared the marker, and reattached the nose. 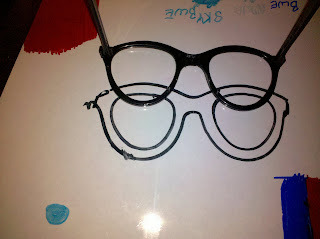 Surprisingly the Sharpie glasses worked almost as well as the original version! The 3D effect worked incredibly well and the only difference was that the image was not quite as crisp. All in all it was a fun experiment and now Adam and I both have a pair of super sweet glasses that we can wear while working on the comic. 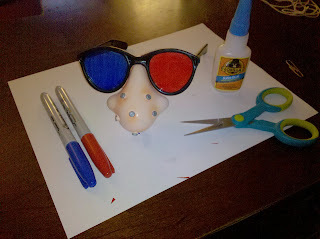 I know that there must be other cool and creative ways to make your own 3D glasses. If you have any ideas or tutorials that you want to share please leave a comment and send them our way! We're always looking for more ideas from crafty people and I'd love to feature them on our blog. How do you 3Diy?